In these troubled times, the theme of building walls, creating barriers and keeping others out is one that holds particular resonance. There appears to be growing a sense of intolerance of others, a desire to become more and more insular, an overwhelming feeling of keeping what we have to ourselves. To not let down our guard. Whether that be Trump’s Mexican wall or the UK’s move away from union with other European nations, the fact remains barriers not only exist but are actively encouraged. This is not a new theme. Throughout history the examples of walls are legendry. The Berlin Wall, The Great Wall of China or, across the Northumbrian moors, the one built by Roman emperor Hadrian to protect the furthest extremes of his empire from barbarians from further north. 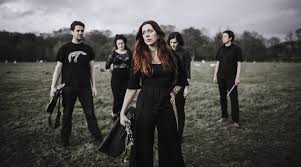 A wall that looms large in the new album by Kathryn Tickell, backed by The Darkening. 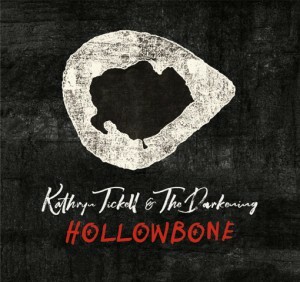 Hollow Bone takes songs, rhymes and stories, both traditional and contemporary, from Tickell’s native North East which she delivers in her well known and loved vocal style. Her gentle lilting singing voice adds a beauty that compliments the landscape from which both herself and the songs are hewn. Referencing places such as Morpeth, Darlington and Holy Island this is an album that paints a picture of a land of mysterious wonder and ancient folklore but within a modern context, both in theme and musical accompaniment. It is the music that really takes this album to a different level. The Darkening bring an almost heavy metal sensibility to their traditional instruments that drives this album along with pace, vibrancy and which truly invokes the large, dark and foreboding expanses of England’s most northern county. The interplay between Tickell’s pipes and the accordion of Amy Thatcher is as powerful and emphatic as any rock duo you could name; the folk equivalent of Deep Purple’s Blackmore and Lord perhaps. And in doing so this band have made Hollow Bone an album that welds ancient and modern in a way that has vitalised the music and stories they wish to tell. Hollow Bone is a massively impressive piece of work. Like the county it is inspired by and the stories it tells this album is hugely significant in it’s expansive ability to inspire. Dark, brooding yet magnificently loud and expressive Hollow Bone is a joyous collection of brilliant songs and stories beautifully told.